Did you know that those who intend to achieve the healing of chronic problems are unlikely to succeed? Why? Because the vast majority of clients we Oriental Medicine practitioners see in clinic refuse to take responsibility for the faults in their lifestyle that contribute to the cause of the problem. Oriental medicine is ’cause-oriented’, which means we identify the fundamental contributing factors that lead to symptoms, disease, and a compromised quality of life. HOWEVER, those who willingly take full responsibility for their choices, actions, diet, and patterns are extremely likely to succeed. It all comes down to you… heal thyself (and I’m here to help you). I didn’t make it up. This is over 2500 years of skilled practice and refinement of health management expressing the truth. If you are really intent on improving your health then you will be challenged immediately by the higher-ups to find out how serious you are. If you are not serious, then don’t waste your time with real healing, and head to your physician. I hear he has a list of medicines and an even longer list of health-damaging side-effects at the ready for you. 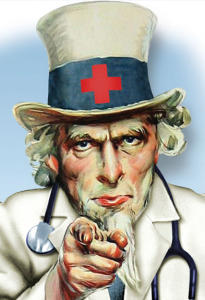 Big Pharma wants you!